Don’t Miss These Acts On the Nakano Theatre Stage! Get your FREE tickets to the South Bay Festival of the Arts! 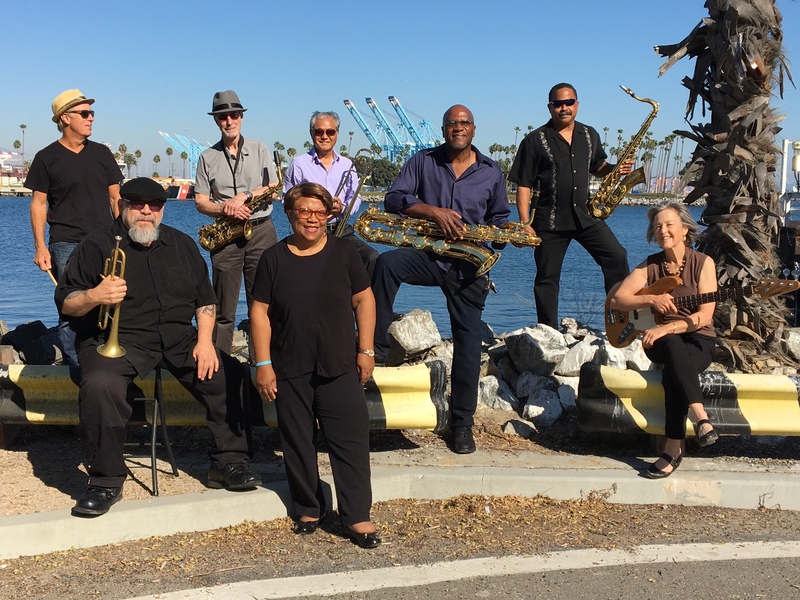 The 2nd annual South Bay Festival of the Arts on June 23, 2018, will feature more than 15 musical acts on three different stages. Here is a sneak peek of the acts performing at the Nakano Theater. Click here to download the complete show and workshop schedule! An eight-piece combo of five horns and a rhythm section makes up The Harbor Jazz Ensemble Little Big Band. Known for playing popular arrangements of swing, pop, and jazz songs, their performances also often include a vocalist who sings beloved jazz standards. Since 1962 the Palos Verdes Symphonic Band has been a popular member of the Los Angeles music scene. Originally founded by retired surgeon Dr. Eugene Reinaldo, the band is approximately 60 members strong. Members include music teachers, engineers, doctors, homemakers, amateur musicians, and former professional musicians. 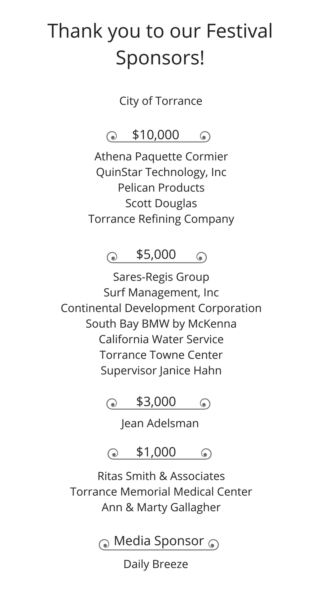 They perform throughout the year in Palos Verdes and surrounding South Bay communities. The Palos Verdes Symphonic Band performs a variety of shows during holidays and community events with a wide range of musical programs – marches and lighter programs during the summer; traditional masterworks from famous composers; seasonal concerts at the South Coast Botanic Gardens; and the annual Green Hills Memorial Day celebration. For this performance, the Palos Verdes Symphonic Band flute ensemble is made up of four flutes and a bass flute -several of whom have played in the Band for many years and continue to make history. The group’s repertoire includes light classical, popular tunes, Irish music, Spanish songs, and jazz, all with a pure and delightful sound! At some performances, the ensemble may include additional flutes, an alto flute and a piccolo to add range and depth, or as few as two flutes. The flute ensemble is honored to perform for the second consecutive year at the Torrance Cultural Arts Festival. Vibrant children’s entertainer, Jamie Shaheen, will conduct a sing-along of her original catchy, easy-to-learn songs. Guaranteed to get kids of all ages singing along, dancing to the beat, and having a great time, audiences won’t be able to resist Jamie’s effervescent personality and sense of fun! Take a break from the sunshine and give the little ones a chance to rest while listening to the story “Cub’s Wish” read aloud on stage. The versatile Palos Verdes Symphonic Band wind ensemble is made up of a unique combination of flute, soprano saxophone, horn and bassoon, playing a program of movie tunes, fun popular songs and patriotic marches, ranging from the music of Abba to movie music as diverse as Star Wars and La La Land. Because there is very little music available for this unusual group of instruments, the members transcribe and rearrange the music themselves to bring out the unique tone color of each instrument. Dennis Forel started his long and illustrious career as a balloon sculptor in 1975. Ever since then he has wowed audiences at state and county fairs, amusement parks, shopping centers, and special events all across America. Not only does he create astounding balloon animal sculptures, he also has a popular and entertaining magic act that he performs at clubs like The Magic Castle, the Troubadour, and Hennesey’s in Hermosa Beach. The trombone quartet is comprised of members from the Palos Verdes Symphonic Band. You may have seen us at the Rejoice in Art Festival at Riviera United Methodist Church. The trombone quartet performs a wide variety of music, including classical, jazz, and Latin. These acts, plus more, will perform in the George Nakano Theatre during the South Bay Festival of the Arts on June 23rd. Head on over to the Festival page for the full line up and schedule! Get your VIP access here!